Licensing Changes: PSQL v13 licenses are no longer tied to the entire hardware fingerprint of the server – they are tied ONLY to the hostname. This makes the v13 engine much more hypervisor-friendly for use in virtual machines and full-server failover environments! So if your IT staff has configured the virtual server environment to optimize performance by moving individual virtual machines (servers) as needed, PSQL v13 will eliminate the need to “repair” the license, which is something that happens with PSQL v11. In a second important change related to licensing, the PSQL v13 Server engine no longer requires constant internet access to stay activated. Online Database Defragmenter: Most PSQL administrators are familiar with the venerable "Rebuild Utility", which can both reclaim deleted space and shrink index structures to their most optimal state. New with PSQL v13 is the ability to run this process on "live" files -- while the system is in use! This important new feature will allow you to maintain your database, even in 24x7 operational environments! Easier Installation: PSQL v13 brings some new capabilities to ease installation. There will only be ONE Client installer, and it will be smart enough to install all applicable components -- eliminating the issue caused in previous versions when users install the 64-bit Client and find that their 32-bit applications (such as AutoEDMS) do not work. Developer-Level Updates: Software developers now have access to the ADO.NET v4.1 drivers (though 3.2 and 3.5 have been eliminated), new features through JDBC and ODBC for Unicode, and PDAC components for design-time (32-bit) and runtime (32 and 64-bit). This is important for AutoEDMS sites who create their own apps for accessing AutoEDMS data outside of the main AutoEDMS program. The next update for AutoEDMS v6.5 is "Service Release 6", which includes several enhancements and new features – see SR6 Details for more information. The “SR6” update is available to AutoEDMS customer sites who have an active “All-in-One” Maintenance Plan with Logical Systems, and who are running v6.5 r2sr5c (SR5c) – you can check your current version/release by picking the ? button on the toolbar. ​​Customer sites not currently running AutoEDMS v6.5 r2sr5c (SR5c) can be upgraded with a 'migration' method, bringing their site-specific Auto-EDMS data over to a new installation of the SR6 release. A Logical Systems support specialist will assist with the migration to assure that no data is lost in the process, and to assure minimum 'downtime' for your AutoEDMS users. You can obtain more information about the SR6 update requirements or process by using the "Contact" form on our website. For sites using AutoEDMS to extract attribute data from their AutoCAD drawing titleblocks, a new Form is available which greatly simplifies the configuration over previous manual methods of editing the ATT file… we call this new Form the “AutoEDMS Titleblock System”, also known as the “ATS”. 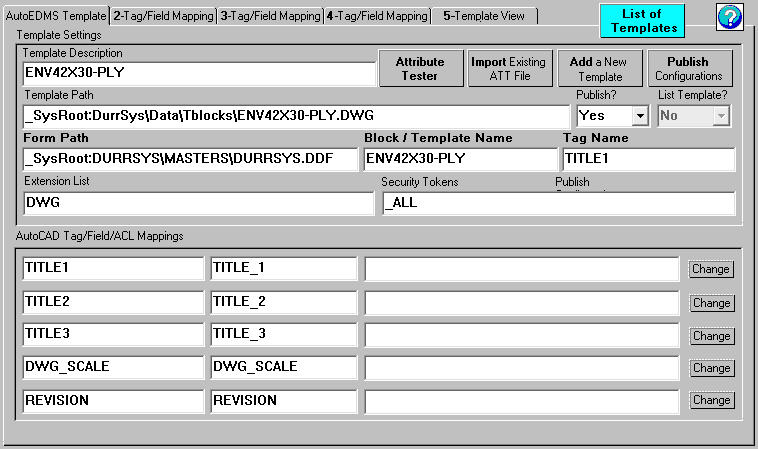 Simple adding of new titleblocks by browsing and selecting a DWG containing the titleblock. Ability to configure up to 35 attribute tags for a single titleblock. Includes an “Attribute Tester” feature for checking tag names within the titleblock. Access can be restricted to only “administrative” users via AutoEDMS security. Simplifies adding the attribute extraction feature for sites who want to add it to AutoEDMS. For more information on the “ATS”, please contact Logical Systems. ​​For our customers needing remote access to their drawing and document data, Logical Systems is proud to announce “AeWeb”, a new browser-based interface for the AutoEDMS document management and workflow system. AeWeb allows remote users to search for and view drawings and documents from their mobile devices such as tablets and smart phones, or from desktop or laptop computers. Click here for details. For more information on AeWeb for AutoEDMS, please contact Logical Systems! Many AutoEDMS sites have reported disabling the display of “autoimages” due to difficulties and inaccurate results with DWG files saved with AutoCAD versions 2010 and later. With the “QwikVue Suite”, Logical System makes it possible for you to regain the use of this popular and valuable feature, which aids in quicker locating and identification of drawing files! Microstation v8i DGN files are also supported in the new “AutoImage via QwikVue” technology. Creation of autoimages with black or white background. Ability to display (or disable) true line weights according to settings in the DWG or DGN file. “Force to Black” option – all black or all white object lines, depending on background color. Display of a parent drawing’s external reference (XRef) files, including support for QwikVue’s XRef path option. For more information about the "QwikVue Suite", the updated autoimage technology, and how they can help your site, click here, or contact Logical Systems.